To help you understand the most important factors in swim training, I will describe swim zones based on a simple test, and discuss the key TrainingPeaks data analysis tools to help you use them to optimize your training. VO2max refers to the maximum amount of oxygen that an athlete can utilize during exercise. While laboratory tests can give exact values, field tests can provide reliable measures for your day-to-day training and competition. To find your VO2max pace in the water, you’ll need to perform a test similar to the 20 minute time trials you’ll find in running and cycling. In swimming, your average pace for 400 m time trail is considered a reliable training benchmark for your VO2max values [1,2]. By using a 400 m test (described below) you can easily set accurate training zones—your ability to swim at different intensities is a key factor leading to improvement. In triathlon, different intensities correspond to certain distances. Understanding this relationship will help you prepare for your race and assess your strengths. Zone set up is based on 5 seconds difference between each intensity, making it easy to remember and adjust. To test your VO2max pace, you need to swim a 400 m time trail—just remember to give yourself a generous warm up. This will help you reach your maximal capabilities, and give you more accurate zones. For the most accurate time, ask a friend or coach to record your 100 meter splits and stroke count, in addition to your 400 meter total. 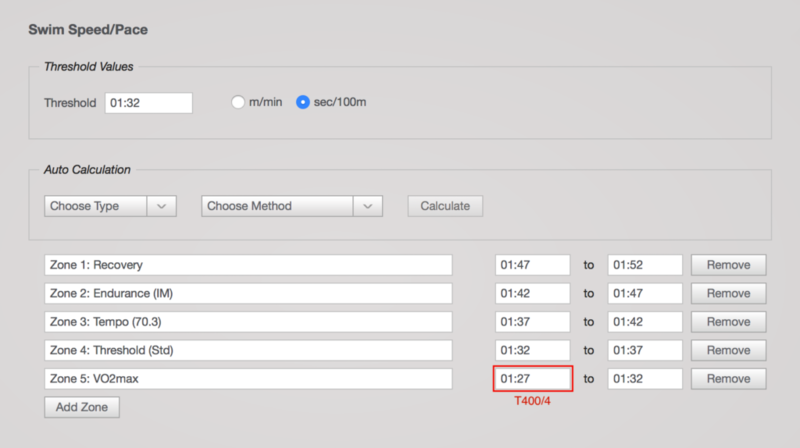 If you are an experienced swimmer (sub 6 min per 400 m) you can take this average directly. If you are new to the sport or have not been consistently swimming, it is good to add on another second to each zone and repeat the test after couple weeks of training. Zones are described below. Abbreviations of corresponding triathlon distances are indicated in brackets. Zone one should feel like an “easy swim” or “cool down” etc. Exercise at very low intensity might not feel as satisfying, but it is enough to induce significant physiological adaptations, despite minimal sensation of muscular effort/fatigue. Zone 1 should require no concentration to maintain pace. Conversation is possible. This is typically used for active recovery after hard training days/races, between intervals, or for recreational/social purposes. Classic long slow distance (LSD) training. In Zone 2 the sensation of muscular effort/fatigue will be generally low, but may rise to higher levels (e.g., when using paddles or tether). Concentration is generally required to maintain effort, especially at upper half of range and/or during longer training sessions. In Zone 2 your breathing will be more regular than in previous zone. Frequent (daily) training sessions of moderate intensity and duration in Zone 2 are possible, but complete recovery may take more than a day. Intensity in this zone corresponds to long distance triathlons i.e. Ironman. Typical intensity of fartlek workout. In Zone 3 there is a greater sensation of muscular effort/fatigue than in Zone 2. You’ll need to concentrate to maintain this pace, especially at the upper end of the range, to prevent effort from falling back. Breathing will be deeper and more frequent. Recovery from training sessions in this zone takes more time then after Zone 2, but consecutive days of training are still possible. Intensity in this zone corresponds to middle distance triathlons i.e. Half Ironman. Zone 4 will create a continuous sensation of moderate or even greater muscular effort/fatigue. Effort sufficiently high that sustained exercise at this level is very demanding mentally. Zone 4 efforts are typically performed as multiple ‘repeats’, or ‘sets’ of 10-30 min duration. Consecutive days of training at this level are possible, but such workouts should be performed when rested/recovered so as to be able to maintain intensity. This zone corresponds to standard distance triathlon such as Olympic Distance. Zone 5 is the typical interval intensity intended to increase your VO2max or swimming speed. In Zone 5 you’ll feel strong to severe sensations of muscular effort/fatigue, such that completion of more than 30-40 min total training time is difficult. Zone 5 workouts should be attempted only when adequately recovered from prior training. Consecutive days of zone 5 work are not necessarily desirable—though Zone 5 intervals might also be used to keep your workouts fun and keep athletes within the group a little bit competitive i.e. by implementing relays. 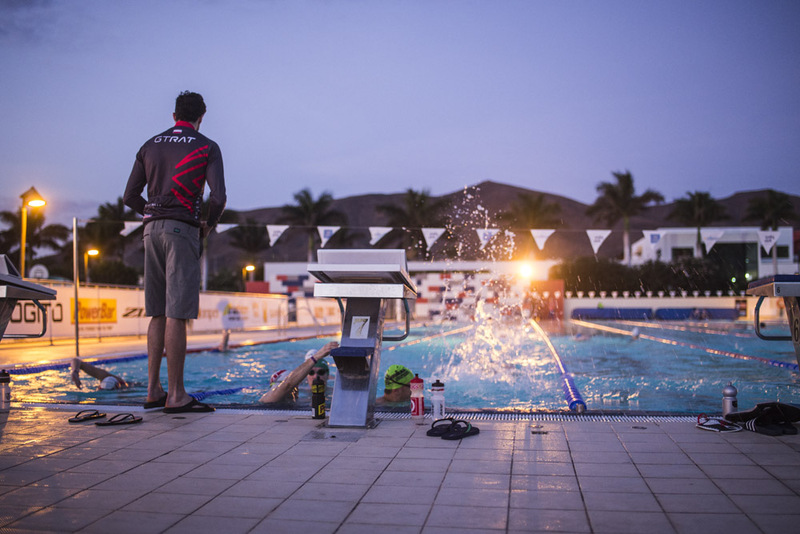 In Training Peaks, a range of tools is available for coaches to analyze swim training from different angles. As you can see in the picture below, I recommend using 3 main diagrams and charts. 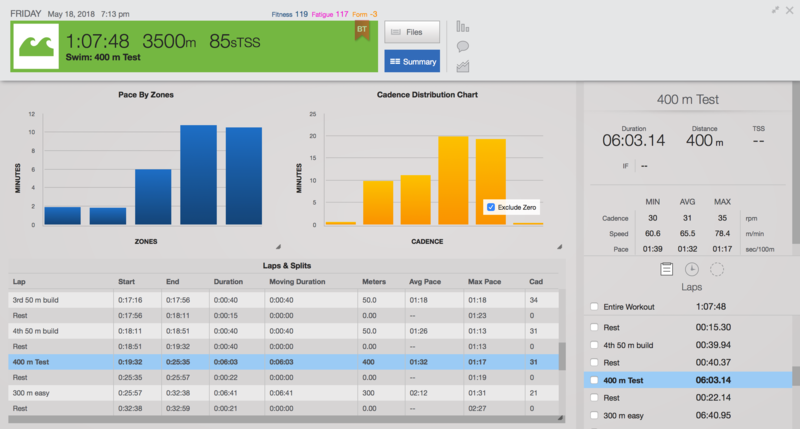 Laps and splits can easily indicate if training was completed according to plan and if the intervals were paced correctly. Usually, it is good to compare interval times of similar sessions to observe the improvement. Time in zone for the sessions will help you understand the session objectives. The main set is usually designed to improve on a certain pace. Therefore you will see that you that one bar of this chart is taller then others. This indicates zone you were working on most. For time restricted athletes there is always a blend of intensities included in the session, since a constant pace is barely seen in racing. The most important thing is to know what you are working on and look for improvement. Open water swimming requires higher arm turnaround than pool swimming. This is mainly due to environment, since swimmers have to deal with waves/chops or simply not to get caught by other swimmers around. Therefore it is reasonable to analyze cadence distribution, especially after racing, and compare it with training data when main set was designed to work on the race pace. Cadence (or number of strokes per minute divided by 2) can also help with understanding the relationship between swimming technique and efficiency. Generally, person who can cover greater distance per stroke has more effective swimming technique, but to be able to swim fast, cadence needs to be optimally high too. Therefore coaches always seek for balance between stroke rate, stroke length and swimming speed. Jakub Adam is certified as British Triathlon Federation Level 3 coach with a Master degree in Physical Education and Sport Science. He has spent his entire life around fitness and multi-sports. 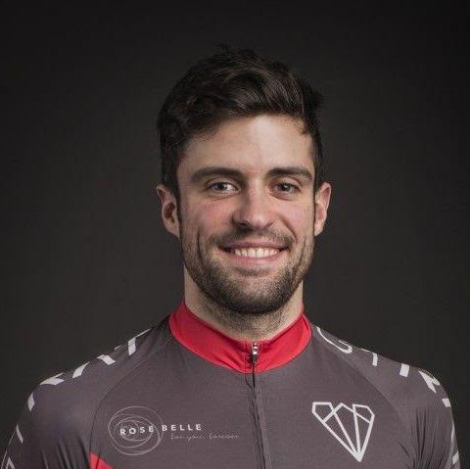 He is a passionate all-around athlete, a well-educated triathlon coach and a co-owner of family business Olimpius. Through his individual coaching practice, he helps with understanding proper form and technique, choosing useful training parameters and setting accurate intensity levels, so you can reach your potential and remain injury free.